The Alaska lease agreements, for residential and commercial use, is between a lessor that agrees to let a lessee use property for an amount paid on a periodic basis. All forms must be filled-in pursuant to the respective State Statutes (Residential: Title 34, Chapter 3 & Commercial: Title 45, Chapter 12). Once an agreement has been written and signed by both the lessee and lessor the document becomes legally binding for both parties. Rental Application – It is recommended, although not required, to have the tenant be verified of their income and/or background before the landlord agrees to a rental agreement. Commercial Lease Agreement – For the use of any type of business related property such as retail, office, and/or industrial. Lease with Option to Purchase (Lease to Own) Agreement – A standard residential lease with the added benefit of having the power to purchase the property during an agreed upon option period. Month to Month Lease Agreement (AS 34.03.290) – Known as a tenancy at will which allows either party to cancel the arrangement with at least thirty (30) days’ notice from either party. Room Rental (Roommate) Agreement – To be signed by all the members of a shared living situation to establish the rules for common areas and payment(s) for utilities. Standard Lease Agreement – Fixed arrangement of usually one (1) year but can be for any amount of time as agreed by the parties. Sublease Agreement – A tenant may elect to have someone else move in and continue the lease under the arrangement that is current with the landlord. Termination Lease Letter (§ 34-03.290) – Used to cancel a month to month agreement by sending through certified mail or serving the notice through another way legal in the State of Alaska. 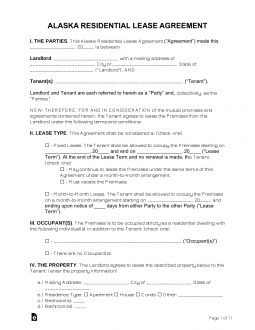 Absence (§ 34.03.150) – The agreement must state that if the tenant leaves the property for more than seven (7) days that the landlord is to be notified. Lead-Based Paint – Federal law requiring all housing units built prior to 1978 to issue this disclosure and brochure to new tenants. Identification (§ 34.03.080) – The landlord must write the person(s) authorized to receive notices/demands by the tenant. Withholding Security Deposit (§ 34.03.070) – If the landlord would like the option to withhold the security deposit for after the stay, for any reason, the terms must be stated. Access (§ 34.03.140) – Landlord must give at least twenty-four (24) hours notice to the tenant before entering the premises. Maximum Amount (§ 34.03.070) – The landlord can only charge a maximum amount of two (2) months’ rent unless the amount is more than two-thousand dollars ($2,000) under which this section is irrelevant. Returning to Tenant (§ 34.03.070) – Fourteen (14) days if the tenant leaves on-time or gives proper termination. Thirty (30) days if the tenant did not give proper termination to the landlord.